There’s nothing like getting ready for bed and noticing an insect crawling across your bedroom floor. Seeing an unwanted insect that has invaded your kitchen cabinets is not a sight individuals enjoy when preparing dinner. If you’ve noticed a spike in insects around your home, they’re not going to go anywhere unless you take charge. Ignoring these creepy crawlers can end up making thing worse as they often reproduce extremely fast. At Eco Tech, we’ve come up with an all natural extermination option that is focused on keeping your family and pets safe. If you are in the Minneapolis, MN area and are in need of insect extermination services, our team has you covered with ease. Experience is important when it comes to choosing an insect exterminator. Not only does an exterminator need to know the fine details regarding the types of insects that are in the Minneapolis, MN area, but they need to also have a proven process that will remove and keep these unwanted pests away from your home for good! At Eco Tech, our insect exterminators have more than 50 years of combined experience in the extermination industry. Additionally, our dedicated team utilizes an organic insect control application that attacks only the unwanted insects that have invaded your home. You’ll be able to relax after an application from our team because this all natural and eco-friendly insect extermination process does not harm your family, friends or pets in the home. So many of our competitors are less worried about the type of chemicals used during their extermination process and are more concerned about how much money they can make off of each customer. At Eco Tech, that is simply not our business model. 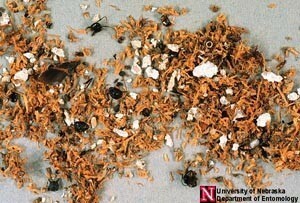 ● Pick up the Phone – The longer you wait, the number of insects that invade your home will continue to rise. These unwanted critters can not only give you nightmares when you sleep, but they can also carry bacteria and disease. The minute you notice an insect issue within your home, pick up the phone and call Eco Tech. ● Detailed Inspection – Next, one of our exterminators will come to your home and perform an in-depth insect inspection to make sure that all of these critters are addressed. Figuring out about where they are coming from and if any damage has been done occurs during this step. ● Exterminate – Once our team has designed the custom extermination process for you, the fun begins! We’ll apply our organic application within your home to get rid of the insects that have invaded your home. ● Keep them Away for Good – Now that the insects have been removed, our insect exterminators will provide preventative measures to ensure that they don’t come back to your home anytime soon! So, if you are looking for an insect exterminator in the Minneapolis, MN area that uses an organic approach, look no further than our team at Eco Tech. Give us a call today at (763) 785-1414 to setup an insect inspection soon!